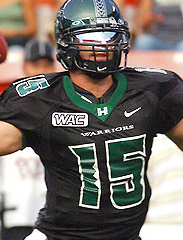 Record-setting Hawaii quarterback, Colt Brennan, had already seen his stock plunge in the upcoming NFL draft. Now, details of a criminal incident while he attended Colorado may have dropped him even further down most teams draft charts. QB Colt Brennan, Hawaii – In February 2004, then attending Colorado, he was arrested on felony burglary and trespassing charges and misdemeanor sexual assault and indecent exposure charges after allegedly walking uninvited into a female student’s dorm room and sexually assaulting her. Brennan pleaded not guilty but was convicted on both counts and sentenced to seven days in jail, 60 hours of community service and four years’ probation. He was dismissed by Colorado.